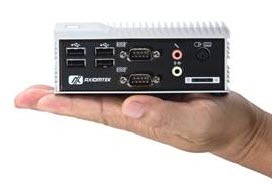 The palm-sized embedded box computer utilizes the ultra low power consumption AMD G-Series APU T40R at 1.0GHz and FCH A50M chipset. The eBOX532-100-FL is fanless and operates under a thermal solution that helps the system remain cool and function without any noise. Integrated with Radeon HD 6320 graphics controller with Directx 11 support, the compact unit offers excellent 3D graphics. In a IP40-rated and rugged aluminum & cold-rolled steel enclosure, the eBOX532-100-FL is ideally suited for digital signage applications, in-vehicle PCs, in-flight infotainment systems, entry-level gaming, medical healthcare, and other automation & embedded applications.